Relatively good quality and works well. Doesn’t work on all vehicles listed under its coverage and you can’t perform certain functions. User instructions minimal meaning operation is largely based on trial and error. 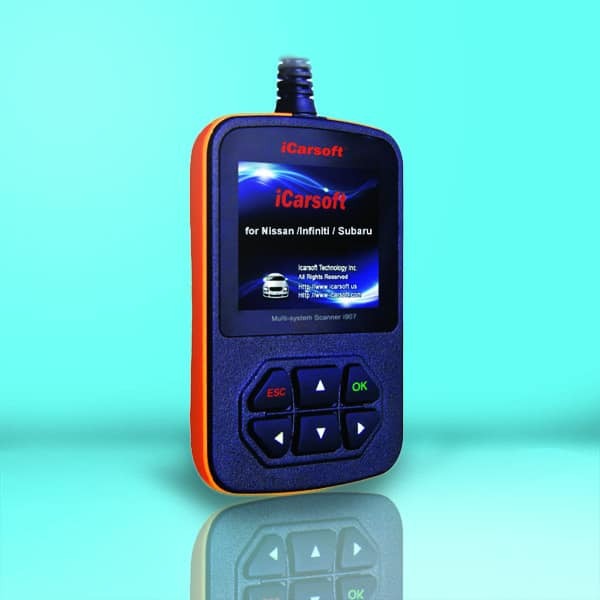 The iCarsoft i903 is a vehicle diagnostic tool designed for the professional mechanic who’s looking to increase efficiency when conducting car repairing services. Not only does it allow quick detection of problems in vehicle systems but it provides you with accurate ways on how to solve them. Though not the most popular model on the market judging by the number of reviews, we believe you’ll still get value for your money if you select it. To learn more about its features keep reading our review as we discuss where it will work best. 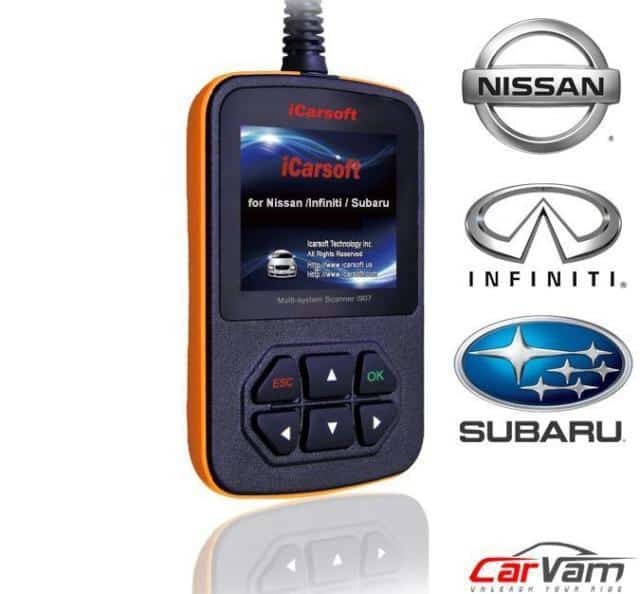 Here we have an engine vehicle diagnostic tool which is compatible with Nissan, Infinity and Subaru. It also works on US and Japanese models including Toyota and Mazda. However, though it’s said to analyze the full system on the above mentioned vehicles that’s not always the case. Some customers have noted it doesn’t support the Subaru ABS. Also, it doesn’t display transmission fluid temperature for some Subaru models for instance the Outback 2.5 engine. It features a colorful TFT screen for clear readings on problems discovered. The unique diagnostic software will ensure it picks up issues not normally discovered by standard scanners such as code faults. If a fault code is stored with the tire pressure monitoring system (TPM), this device can clear it. Important note: Though it can clear codes in the TPM system it can’t reset or program the sensor so you’ll need another device for that. You’ll appreciate that it comes with all current updates you need to operate it optimally. This product weighs only 1.1 lb., meaning it’s pretty small and lightweight for easy handling. It comes with a 1-year warranty for any repairs that arise. Before selecting this product know that unfortunately it may expose you to chemicals which are known to the State of California to cause cancer and/or birth defects. The DIY mechanic will appreciate this gadget which allows for automated self-diagnostics. Not only will it accurately detect the problem it’ll help you quickly map a way forward on how to solve the issue. Because it works based on wireless technology, you can expect to dramatically cut down the time you take in repairing a vehicle. This is due to the efficiency and convenience that comes with not having to connect machines to cables during operations. Unfortunately if you don’t really understand the vehicle systems you might face challenges using this product. It doesn’t provide much information on how to perform some of the functions so we wouldn’t recommend it for the novice mechanic. For instance, it doesn’t tell you how to see certain codes as well as enter new ones. You’ll have to largely depend on trial and error to figure out how it works. As soon as you receive your product, it’s ready for use. No registration whatsoever is required – simply unpack and start scanning. It also comes with the OBD2 adapter that connects to the OBD2 socket. Note that this product is mainly for diagnosing the engine and transmission on vehicles. As a result other car accessories such as AC and electrical parts are not included in the package. Increase your operational efficiency by choosing this model which ensures swift diagnosis and equally swift repairs thanks to its automated mechanisms. You can perform a host of services including scanning the engine as well as show the live data of the vehicle in question. It allows you to scan different vehicle systems including the anti-brake and airbag system—detect problems and rectify them. Apart from reading these systems it can reset them, including the engine codes. You can also reset false indications without interacting with the dealer which saves on servicing time. The scanner is capable of handling not only multiple but complex defects present in motor vehicles. This ultimately means you can fix any car with ease regardless of the magnitude of the issues it has. With this device you can update your laptop or PC for hard disc navigation. This essentially means improved and organized data management. All your customer information and vehicle records will be readily available when needed. Now that you have an idea of how it works, is it a tool you could go for? We think it’s worth considering where performance and functionality are concerned. If you specialize in repairing cars like Nissan and Subaru then you’ll definitely find it useful. However if you want to repair and service a wider range of vehicles this tool isn’t for you. Unfortunately it doesn’t come with much information to aid in your vehicle analytical procedures. For that reason make sure you have substantial knowledge regarding how different vehicle systems operate before picking this tool. But overall, it’s well made and works well so it could be the machine you’ve been looking for. If you still have any questions, why not leave a comment below?